Professor Stephen Vasciannie Examines Privileges and Risks of being a Diplomat — UTech, Ja. 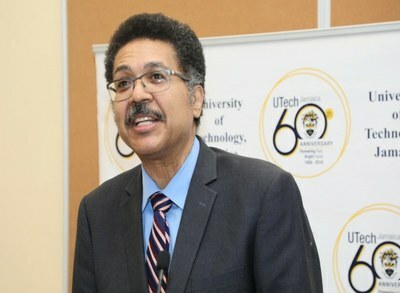 Professor Stephen Vasciannie, CD, President, makes a point during his UTech, Jamaica 60th Anniversary Distinguished Lecture titled, “International Law and the Diplomat: Jamaican Practice” held on Thursday, March 21, 2019 at LT50, Shared Facilities Building, Papine Campus. Seated in the front row, from left, are Mr. Peter Sangster (son of Dr. Sangster), Dr. the Honourable Alfred Sangster, former President, UTech, Jamaica, Mrs. Mercedes Deane, University Registrar and the President’s wife, Dr. Lisa Vasciannie. In his wide ranging talk, Professor Vasciannie looked at the provisions under the Vienna Convention on Diplomatic Relations (VCDR) which defines the framework for diplomatic relations between independent countries. He elaborated on diplomatic privileges such as inviolability of premises, exemption from taxes, free communication, inviolability of person (which protects diplomats from arrest and detention) and immunity from criminal jurisdiction and civil jurisdiction. 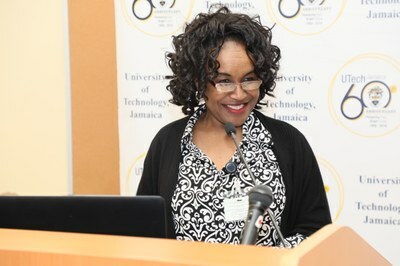 In looking at the sensitivities of diplomatic relations, Professor Vasciannie elaborated on several well-known cases and incidents in international law and the Jamaican practice which have challenged socio-political relations between receiving and sending governments and citizens of their countries. 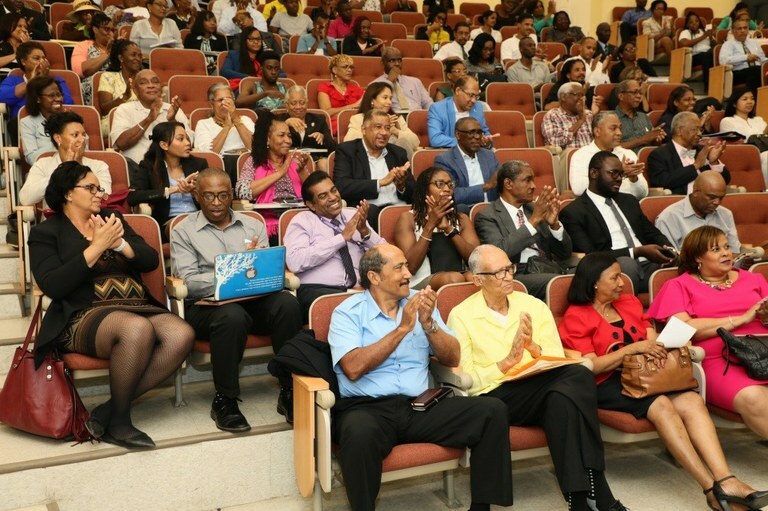 In attendance for the lecture were attorneys, ambassadors, educators, members of faculty, staff and students of UTech, Jamaica and other members of the public. Among the special guests was former UTech, Jamaica President, Dr. the Hon. Alfred Sangster, OJ. The proceedings were chaired by Professor Colin Gyles, Deputy President and the Vote of Thanks was given by Professor Cynthia Onyefulu, Associate Professor, Faculty of Education and Liberal Studies. Presidents: L-R: Professor Colin Gyles, Deputy President, Dr. the Hon. 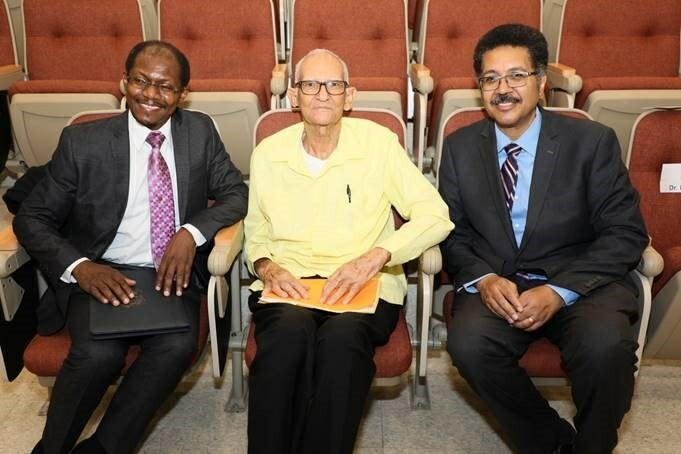 Alfred Sangster, OJ, Former Principal and President, University of Technology, Jamaica and Professor Stephen Vasciannie, CD, President, University of Technology, Jamaica share pleasantries prior to the start of the Distinguished Lecture.